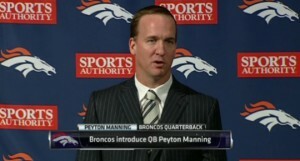 (by Doug Ernst, DouglasErnstBlog.com) – Congratulations to Peyton Manning on signing a 96 million dollar contract. Congratulations to John Elway for landing one of the best quarterbacks of all time. And congratulations to both of you for showing the world once again that pride and greed are capable of clouding the judgment of good men. I [hope] that Peyton Manning lives a long and healthy life, but at this point in his career I can’t fathom why he would literally put his neck on the line for the game of football. Yes, he’s made football his life…but life is also about more than football. Life is about more than any career, and part of that is family and loved ones. Like a scrambling quarterback with a weak offensive line, I can’t quite shake the feeling that this will all end badly. Posted at DouglasErnstBlog.com on March 21, 2012. Reprinted here on March 22, 2012 for educational purposes only. 1. What is the main idea of Doug Ernst’s blog post? 2. Do you agree with Mr. Ernst’s assertion about Peyton Manning? Explain your answer.